Kilfrost installed the Compact C Range progressing cavity pumps from Mono NOV to improve the efficiency of its manufacturing process. A pdf version of this article is available on the right-hand side under 'Downloads'. Based in Northumberland, UK, Kilfrost Ltd has installed the Compact C Range processing cavity pumps from MONO for a dual purpose. They are being used in the manufacture of its range of specialist de-icing products to fill IBC's (intermediate bulk containers) at 20 m3/h and also road tankers at 36 m3/h. As the anti-icing products have a delicate structure, a very gentle pumping action with minimal shear is required to prevent foaming. The rotary, positive displacement action of the Compact C pumps means they do not rely on any centrifugal action for their operation, and there are no major fluctuations in fluid velocity, which is typically below 3.0 m/s. Agitation and turbulence are also kept to a minimum enabling the pumps to handle very shear sensitive liquids which may be damaged or emulsified at high shear rates. The pumps were also supplied with inverter control to allow the customer to increase or decrease the pump speed and capacity to suit the different filling duties required. Mono's Compact C progressing cavity pump range has been designed to fit into compact spaces while reliably performing to the maximum duty requirement of the application. 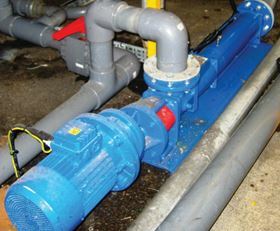 The pump uses positive displacement for process control, variable speed for accurate dosing and features a suction lift capability of over eight metres. As an extension to this range, the EZstrip has also been developed to provide a quick and easy way to disassemble, de-rag and maintain a PC pump in-situ, eliminating the costly maintenance and down time that servicing can often cause.